ABF Outlook Backup is a program to backup Microsoft Outlook 97/98/2000/2002/2003/2007/2010/2013/2016. It allows you to backup and restore your email messages, address book contacts, settings, accounts, message rules, junk email lists and signatures. Outlook data is stored in one backup file. All backup functions can be processed either separately or together. ABF Outlook Backup allows you to backup data on one computer and restore it to another one. 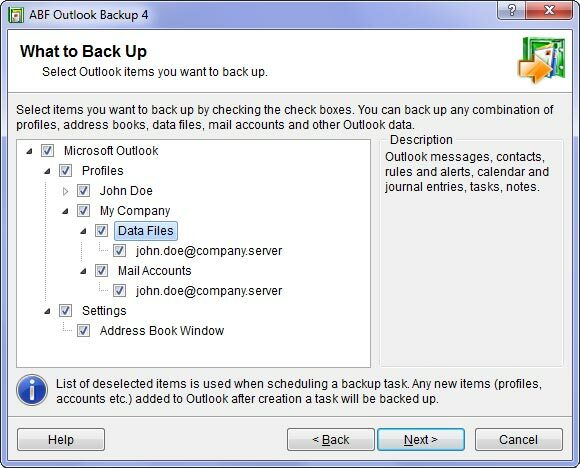 This feature makes ABF Outlook Backup not just a backup program but also an ideal and perfectly functional synchronization tool. This software allows you to add the missing backup capabilities to Outlook in the most natural and handy way. With the thought through, laconic interface you can select to backup messages and folders structure, address book, settings, your accounts, and so on - up to signatures and favorites. We also recommend you to download Anti-Spam for Outlook. ABF Outlook Backup supports command line parameters and can add tasks to the system scheduler.